Anthony Gallo, left, and  Marc Scribner, far  right, listen to Dan Tangherlini. Are Streetcars Good for America? 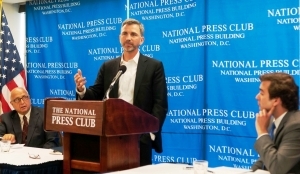 Marc Scribner, Research Fellow at the Competitive Enterprise Institute, said "No," at an NPC Newsmaker event on June 16. Dan Tangherlini, former Administrator, General Services Administration and Director of Transportation for the District of Columbia, said "Yes." Currently 12 metropolitan areas have streetcar projects under construction; eight cities have authorized streetcar projects, while nine are in the advanced planning phase according to the Center for Public Transportation. Scribner argued that streetcars are unable to move as many riders as light- and heavy-rail transit, and potentially even bus rapid transit systems. Streetcar travel times are greater than transit alternatives—and often walking parallel to the streetcar is faster. Streetcars worsen traffic congestion and provide residents with no additional employment access compared to the bus service they are replacing. There may be slight operating cost savings, but these are dwarfed by streetcars’ massive capital costs, which can exceed bus capital costs by a factor of 10, resulting in much higher total costs. Streetcars also slow private auto and bus traffic, reducing mobility and increasing air pollution. He also argued that streetcars at best are just relocating economic development that would have taken place elsewhere in the metropolitan area, benefiting specific property owners and developers at the expense of taxpayers and transit users. Tangherlini argued that there is no question that society benefits from streetcars. He cited the development on H Street in the District of Columbia as an example of how streetcars can lead to economic development. Ecologically, streetcars trump alternative transportation, namely automobiles, because carbon emissions are lower, he said. He noted that streetcars are just one component of a long-term vision of what our cities should be, and that they help support residents by providing an additional transportation choice.